In a process known as ripping, Windows Media Player in Windows 10 can copy your CDs to your PC as MP3 files, the industry standard for digital music. But until you tell the player that you want MP3 files, it creates WMA files — a format that won’t play on iPads, most smartphones, nor many other music players. And for mac user, cd ripping is a problem. So in 2018, you may need a great CD ripper for Windows 10 or Mac. Here’s a list of Free 5 CD ripper software and a Professional CD Ripper for Windows 10 or Mac in 2018 which you can use to rip music from CDs to MP3, FLAC, WMA, WAV, AIFF, ALAC, AC3, OGG, etc. Ripping music from CDs helps you backup your music collection, in case the CDs get scratched or damaged in some other way also in case that they become unreadable. You also get to enjoy in your music on smartphones, tablets and MP3 players. CDex is a portable audio CD ripper software, which works just fine with Windows 10. It will detect audio CD automatically and load it up into the application. Unfortunately on the same audio CD where FreeRIP discovered ID3 tag data (artist and song info), CDex wasn’t able to do the same. It might work better with other CDs, because connectivity with CDDB and MusicBrainz website does exist. This is a free CD ripper software for Windows 10 by Torch that’s easy to use, has a simple interface and a built-in media player so you can preview your audios before you set off the ripping process. It supports most major digital audio formats such as MP3, FLAC, and OGG among others. In order to get this free CD ripper software for Windows 10, you need a full duplex sound card, Windows 10 OS, and a CD/DVD driver, plus some 3.25 MB of space to house it on your computer. It is lightweight but very powerful with amazing features such as normalization or automatic volume adjustment, ID3 tag support, audio file format support for MP3, WMA, OGG, WAV, and others. It also has a built-in media player so you can preview your audios before ripping from the CDs. 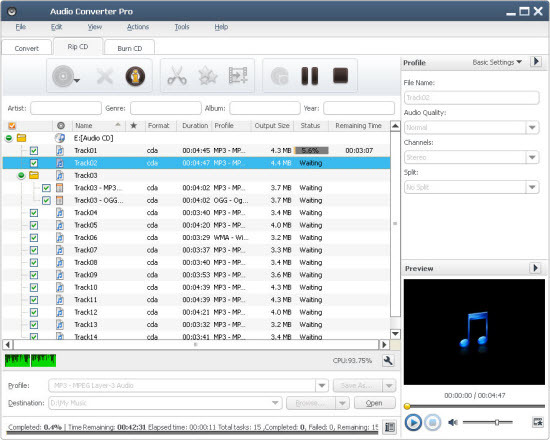 EZ CD Audio Converter Free is probably the most interesting audio CD ripper software, which automatically downloads metadata and album cover, as soon as the application is run. You only need to make sure that the audio CD is in your computer. Output format can be tweaked and metadata can also be tweaked manually, if it’s not correct, or EZ CD Audio Converter Free can’t find it online. Audiograbber is a neatly packed and small in size audio CD ripper software, which has pretty much everything you will need for ripping audio CDs into MP3 files. Output format and quality is completely configurable. To fetch metadata just click on the Freedb button from the toolbar at the top. When done with the setup, click on the Grab button to start ripping songs. UFUSoft Audio Converter Pro (Audio Converter Pro for Mac) is a professional CD Ripper, CD converter, CD burner, audio converter, audio editor for Windows 10 or Mac (macOS 10.13 high Sierra included). It convert CD to nearly all audio formats FLAC, AIFF, MP3, WMA, WAV, AAC, OGG, APE and many others, and make CDs available on different music players. It can batch convert among all sorts of audio formats (including MP3, WMA, WAV, AAC, FLAC, OGG, APE, AIFF, SHN, TAK, Apple Lossless ALAC), extract audio from different format video and HD-video files (AVI, MPEG, WMV, MP4, FLV, MKV, H.264/MPEG-4 AVC, AVCHD). The CD Ripper for Windows 10 or Mac can convert an audio segment or several files at once, split a file into sections, simultaneously output a file into several formats and to the required size, adjust conversion parameters, edit ID3 tag info, add various audio effects, along with a variety of other great features. Moreover, multithreading and multi-core CPU processing are supported for offering high speed conversion. This CD Ripper for Windows 10 is fully compatible with Windows 10, Windows 8, Windows 7, Windows Vista and Windows XP. This CD Ripper for Mac OS X is fully compatible with Windows 10, Windows 8, Windows 7, Windows Vista and Windows XP. Trial version only allow 2 minutes conversion for each file. If your file in is no longer than 2 minutes, only half will be converted. 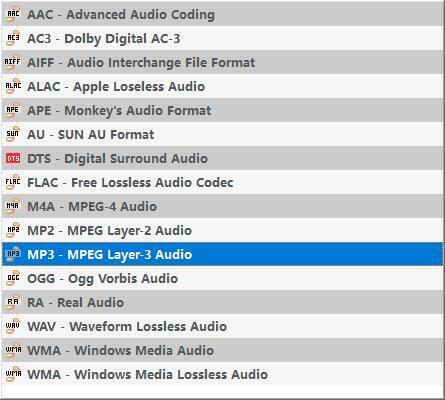 How to Rip CD to FLAC, AIFF, OGG, MP3, WAV, WMA, M4A, M4R, etc. with UFUSoft Audio Converter Pro? Download UFUSoft Audio Converter Pro, install and run it. Insert your CD into your CD driver. Then click “Rip CD” tab in Audio Converter Pro and click “Add CD” button to load CD files. Take rip CD to FLAC in Windows 10 or Mac for example. Click on “Profile” drop-down to choose “FLAC – Free Lossless Audio Codec” from “Lossless Audio Format” category. Click on the “Rip” button start ripping CD to FLAC, AIFF, OGG, MP3, WAV, etc. in Windows 10 or Mac.